TSN Toronto reporter Mark Masters checks in daily with news and notes on the Maple Leafs. The team practiced at the MasterCard Centre on Friday. Before Wednesday’s season opener, Brendan Shanahan sent a message to Toronto’s rising stars. In a rare media availability, the Maple Leafs president urged the team's “young leaders" to resist the urge to set a new bar with their next contracts. Such a sacrifice, while still earning a fair contract, would help keep the core together and the championship window open as long as possible, he argued. What did Auston Matthews and Mitch Marner, both in the final year of their entry-level deals, think of the comments? "That’s what we have agents for," said Marner. "The agents will talk to the team about all that kind of stuff. We have confidence in this room that this team’s going to stay together for a long time." "That’s why we have agents," said Matthews, who was also asked about the matter post-game on Wednesday. "So I’ll keep repeating myself. Let them handle it." What is Matthews directing his agent, Judd Moldaver, to do? Does he want to get a deal done sooner than later? "I mean, that’s kind of a private conversation so I don’t think I’m really going to tell you anything," the 21-year-old from Arizona said. With restricted free agent William Nylander now missing regular-season games while awaiting a new contract, are Matthews and Marner concerned that may happen to them? "Not at all," said Marner. "It's quite a ways away, so not really," said Matthews. Shanahan pointed to John Tavares as an example the younger players could follow. As an unrestricted free agent, Shanahan noted, Tavares took less money to sign in Toronto. "Everyone’s situation is different," Tavares said after Friday's practice. "There’s not a doubt in this locker room [that] everyone is buying in and wants to buy in to what’s going on here. I certainly saw that from talking to a lot of the players during the interview process. I certainly got that sense and it’s why I felt strongly that things can work here ... it's a negotiation and, you know, things take their own time, their own process and sometimes there’s some tough moments through it." Tavares doesn't expect the business side of the game to become a distraction. "When I came here I really got a sense of their character and their ability to handle the spotlight at a young age and do what they do on the ice and being able to handle everything that comes with it." Marner is taking precautions by instructing his agent, Darren Ferris,​ to keep him out of any negotiations unless a deal is imminent. 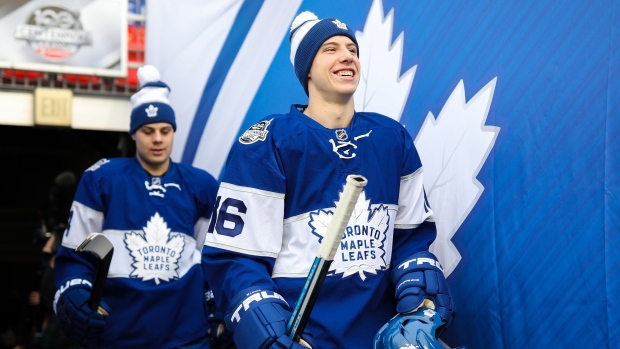 "If there’s any talking, I don’t want to hear too much of it," Marner said, "just let those two talk about it. If it gets there and it gets finished then, obviously, that’d be great for us, It’d be awesome to sign that. But we’re not pressuring each other. We’re here to do the best we can this season and see what happens in the summer." Tavares opened a new chapter in his hockey life on Wednesday, scoring a goal in his Leafs debut. Backup goalie Garret Sparks indicated on Twitter that Tavares may have called his shot when it comes to the second-period tally against Carey Price. Meanwhile, the Islanders opened their season on Thursday winning their first game since Tavares moved on. Was the ex-Islanders captain keeping tabs? The numbers certainly suggest Toronto can be much better. Montreal controlled possession at even strength outshooting the home side 30-20 in that category. Mike Babcock objected to the notion that the problem lies on the blueline. Babcock pointed out that the Leafs had 19 faceoffs in their own end at even strength versus just 10 in the offensive end. So was the issue not having a good enough forecheck or was it in breaking out of the defensive end?